Filled with excitement from Dr. Alan Greene’s keynote speech at last weekend’s Childhood Obesity Bay Area Conference about feeding babies vegetables and whole grains (see last week’s post), I was thrilled to meet Jill Epner: healthy baby food entrepreneur. 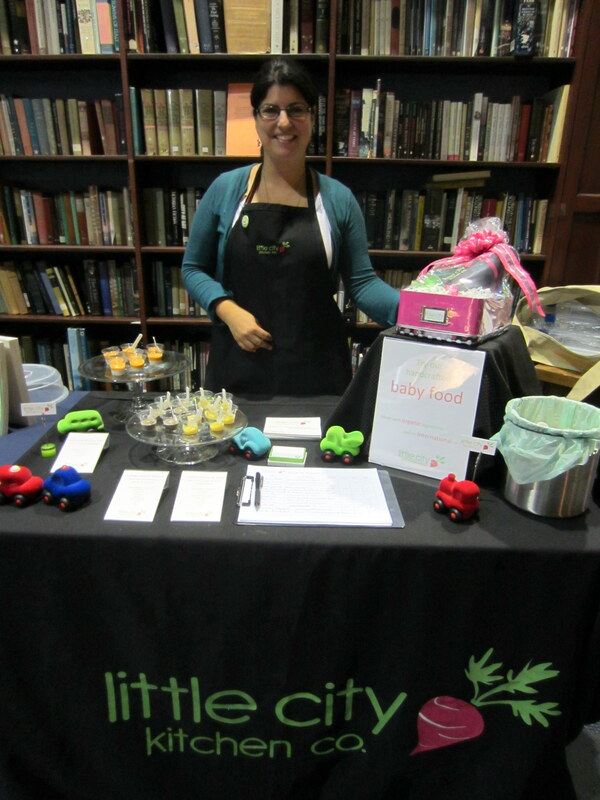 Jill founded Little City Kitchen Co. last June with the mission of exposing kids at an early age to a variety of flavors, textures, and spices to set them up to be healthy eaters later in life. 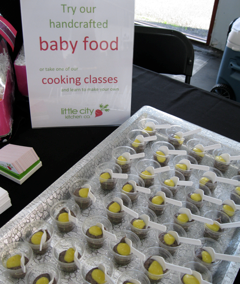 Little City Kitchen Co. offers handcrafted organic baby food, interactive baby food cooking classes, and demonstrations. While talking with Jill, I was struck by the uniqueness of her approach (selling baby food AND teaching parents to make it themselves) in contrast with the traditional Gerber marketing message (you CAN’T make it yourself, trust us instead). I asked Jill if she thought her classes might risk cannibalizing her retail sales. So, what are Jill’s plans for distribution and expansion? She’s currently selling her products, in frozen form, at the Burlingame farmers’ market, and has been creating a more robust distribution strategy. Frozen baby food is still not a widely-known concept, so while retail stores and delivery options are in her plan, the biggest barrier to overcome is educating parents. They need to understand the benefits of frozen baby food over the shelf-stable and highly processed stuff before they buy, so there’s a big culture change that needs to happen in order to sell in those outlets. “I’m doing what I can to close that education gap. It’s part of the reason I started a weekly blog, so that I can help educate parents about a ‘real food’ approach to introducing solids”. In her blog, Jill talks about everything from making your own whole grain baby cereals, to cooking methods and using healthy fats in baby food. Feel free to follow her blog for more information. Other advice Jill would give food entrepreneurs: surround yourself with inspiring and creative people, plan for it costing three times as much as you expect, use every free/reduced resource you can find (her favorite is the Small Business Development Center (SBDC), and unwind with a really great glass of wine after a long week. Very exciting stuff! As more of my friends, colleagues, and classmates get ready to have their first babies, I’m glad I have a go-to source for innovative, organic baby shower gifts, either the food itself or a private cooking class. Good luck Jill! This entry was posted in Uncategorized and tagged Childhood Obesity, Making food, Slow Food, Start-up profile. Bookmark the permalink. Jill has become impressively knowledgeable about nutrition and committed to introducing babies at the start to flavorful and visually beautiful food. Her food is frozen in order to be the freshest when thawed and she is a teacher at heart. I’ve taken two or her cooking classes which were great. She is make an impact in the Bay Area; I love her blog!